Do you ever get that ‘I wish I’d been a teacher’ moment? 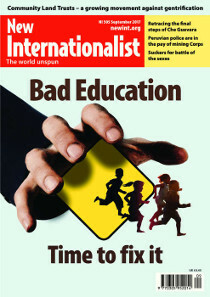 In this September magazine by co-editor Hazel Healy, we look at how the noble endeavour of education is under threat from powerful business interests, while introducing you to those working to take things in a different direction. We also unpick why stories that claim to reveal a biological basis to differences between men and women are so persistently popular and learn about how private corporations in Peru are hiring out the police to do their dirty work.